OLC PRODUCTIONS & LUMA CREATIONS | Celebrating, promoting and producing Latin American and Diversity Arts and Artists. LUMA CREATIONS (aka OLC Productions) presents an exciting and colourful evening of South American Music & Dance with performers from Colombia, Brasil, Chile and Peru. In the award winning and beautiful surroundings of the wonderful Liverpool Central Library you will be entertained with songs from across South America and dances and rhythms from Colombia, Chile, Uruguay, the Andes and Argentina. 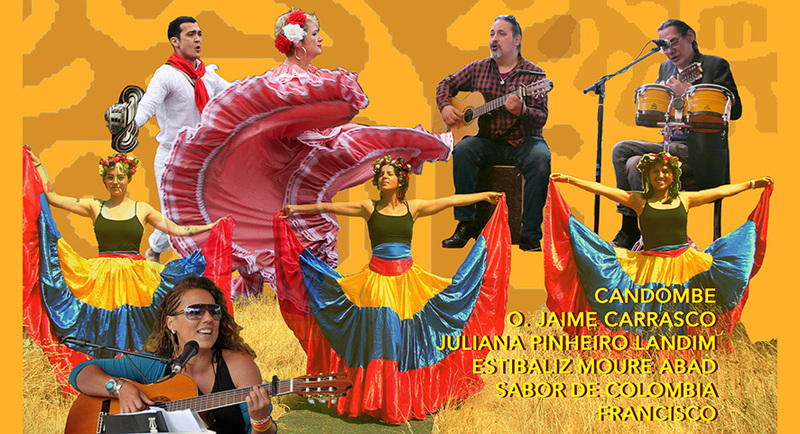 We hope you enjoy this small journey through South AMerica in Music, Song and Dance. LUMA CREATIONS will perform as part of the 45th ANniversary of the Coup in Chile. There will be a vigil at the Sheffield Town hall and then Estibaliz Moure Abad, Oscar & Francisco Carrasco will perform the Cueca Sola in tribute to the thousands of Chilean dissapeared. 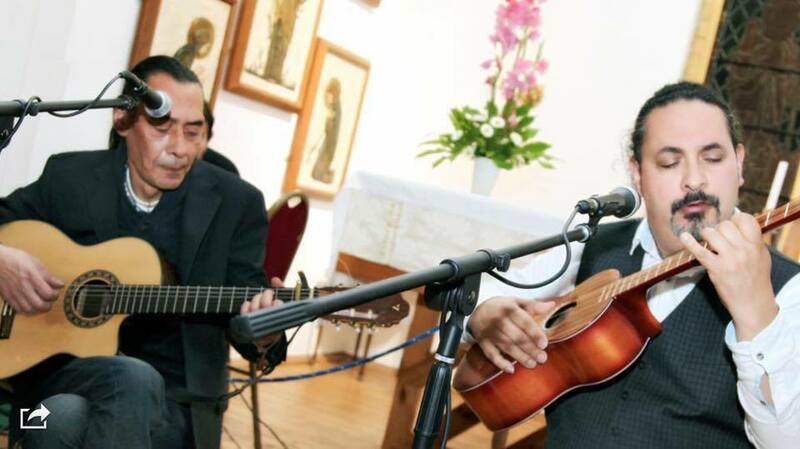 Afterwards they will perform songs from the Chilean Popular Song Movement at the Millenium Exhibition Centre in Sheffield as part of a Chilean Tapestry Exhibition themed under the titles Memorias (Memories). Friday 23 March (All day) – Young MakeFest at Liverpool Central Library We will be delivering workshops in Rhythm & Drum (Oscar Carrasco & Max Alder) as well as K-Oscillators composition (Tristan Brady-Jacobs & Francisco Carrasco). We will have Wondering Musicians – Helen Maher (Accordion) & Jonathan Rasin (Piano). Friday 18 May (10 pm) – We will be presenting a specially produced performance for Light Night in front of the Metropolitan Cathedral. A Drum, Light Manipulation and Dance Presentation with La Bomba Drummers, Steam Punk Society and LUMA Creations performers. Thursday 31 May – (7.00 pm) – We are proud to present CUSAN Theatre (Colombia) with their excitingly imaginative children’s show, “The Princes in the Rainforest” at the Unity Theatre, Liverpool. (More information to come). 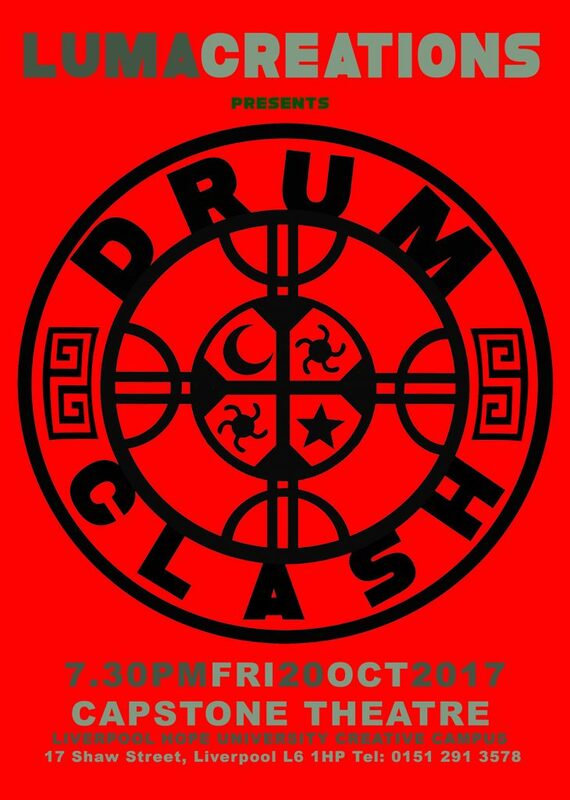 DRUM CLASH is a meeting of Rhythms and Cultures that weave together, clashing and then joining together in an exciting melting pot of the senses. An explosion of visuals and movement presents a colourful journey of discovery that takes us from rhythms of old to an apocalyptic world, where the power of the drum raises above the ashes, and catapults us into a new world. The 3rd EPIC – Event Planning Training programme begins 10.30am, Friday 20th October at John Archer Hall. 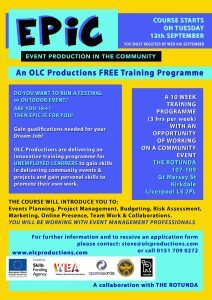 If you wish to be part of this extremely successful course contact steve@olcproductions.com or call 0151 7090272. The EPIC 2 – EVENTS PRODUCTION IN THE COMMUNITY TRAINING PROGRAMME. An OLC Productions FREE Training Programme for Unemployed Learners. DO YOU WANT TO RUN A FESTIVAL or OUTDOOR EVENT? ARE YOU 18+? THEN EPIC IS FOR YOU! Gain qualifications needed for your Dream Job! 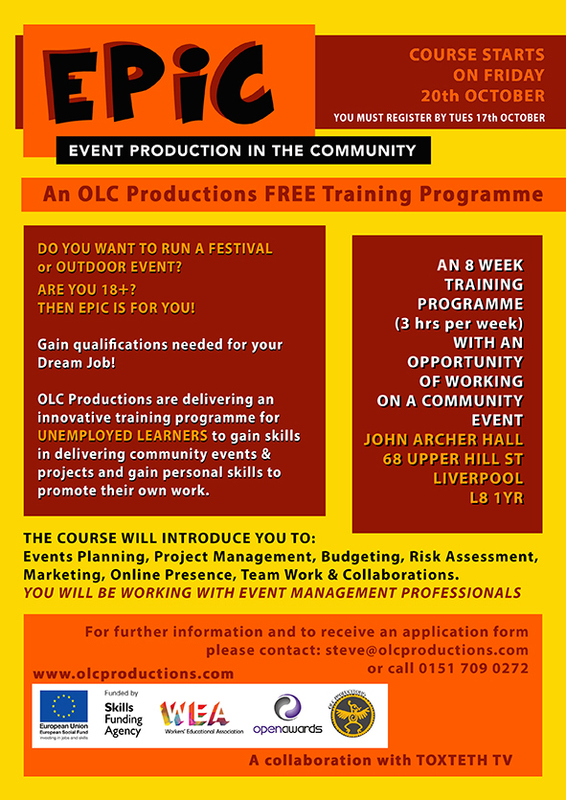 OLC Productions are delivering an innovative training programme for UNEMPLOYED LEARNERS to gain skills in delivering community events & projects and gain personal skills to promote their own work. The first EPIC training programme finished on the 1st August after a highly successful programme and an exciting event planed and delivered by the team. The event was a Community Celebration called The WINDSOR STREET COMMUNITY FAYRE and took place on Tuesday 25th July with over 350 people attending throughout the day. The event included Performances, activities, food, stalls and pony rides. The participants of the training programme learnt about event management, project planning, marketing, risk assessment, production, professional development and much more. They will be receiving a level 2 Business qualification from Open Awards. We have finished stage one of the Urban Growing Project. Plant Beds have been built and growing is happening as we speak. 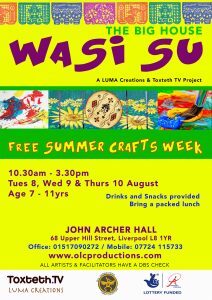 We will soon have some fun workshops and next week from Tues 8 – Thurs 10 we will be holding arts & craft workshops in partnership with Toxteth TV for children 7-11yrs, who will design murals for the plant beds and will pain them in bright colours and patterns. Looking forward to it! OLC PRODUCTIONS will be delivering an innovative training programme aimed at unemployed learners to gain skills to deliver community events and projects and gain personal skills to promote their own work. Have you often wanted to be the person delivering the event you attend? Would you like to plan, produce and deliver a community event? Have you wanted to understand marketing and how to promote your work? Have you wished you could understand website development and social media? Can you commit to 20 weeks training? (one day per week)? 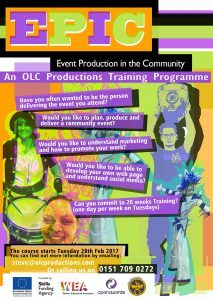 OLC will be working with event management professionals and website designers to deliver this exciting new course from February 2017. – Tackling Road Safety through creativity And many more.